This site is devoted to encouragement and hope during one of life’s greatest challenges: cancer. Whether you walk this path yourself, usher a loved one through the maze or administer care to those facing this quest - you could likely use some support. When we think of hope, we are thinking about the future. This site is devoted to encouragement and hope during one of life’s greatest challenges: cancer. Whether you walk this path yourself, usher a loved one through the maze or administer care to those facing this quest – you could likely use some support. Our story begins in an unlikely place. What began as an amazing sculpture has transcended the limitations of human touch and sight to reach into our hearts and minds – uncovering reserves of inner strength in all of us that we never knew we possessed. 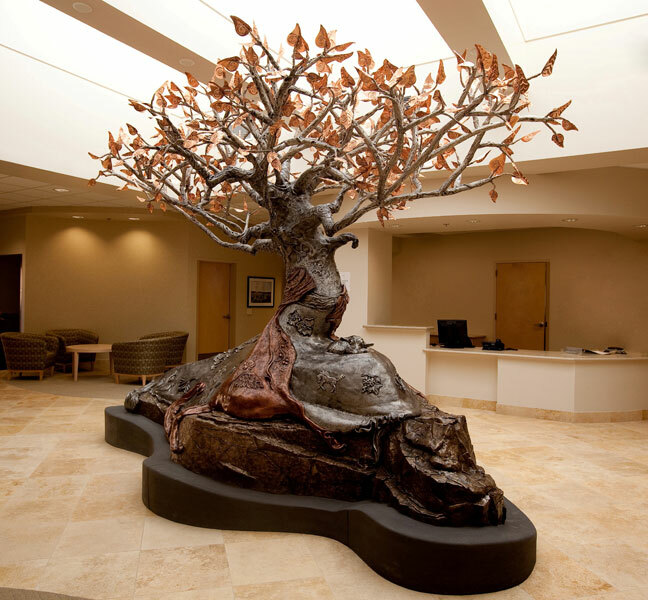 The Hope Tree is a sculpture created by artist Carol Jeanotilla in 2009 for the Martin O’Neil Cancer Center at St. Helena Hospital in St. Helena, CA. Its current day, interactive life and meaning for patients, family and staff are at the center is an extension of the loving environment in which it was created. From the very beginning this sculpture took on a life of its own. The artist drew from her own personal journey with cancer when her young mother died of breast cancer. The artist combined her nearly 20 years as a Registered Nurse with her more than 25 years as a sculptor to come full-circle in the desire to help people heal. In the telling of these amazing stories, we reveal shared tales of human life and triumph over adversity. If “hope is the thing with feathers . .” per Emily Dickinson, then surely encouragement is the wind carrying it aloft to heights never thought possible. Settle in, snuggle up with a cup of tea and accompany us on this exploration of love, hope and encouragement. Watch the documentary short, The Hope Tree, to feel as if you are right there – gliding your hand over the smooth surface of this amazing sculpture. Listen to the artist’s personal description of the sculpture plus her stories of encouragement and hope via podcasts. You will discover the inside stories behind the meaning of The Hope Tree, the making of The Hope Tree, the symbols on The Hope Tree. And there are plenty of resources for you, too. We offer facts behind the real neuroscience of hope and optimism – sharing research regarding the exciting field of actually visualizing hope within our brains. We explore the psychology of survival as this villain – cancer – threatens our very existence. You will find dozens of links to other inspiring sites, videos and resources. Subscribe to our monthly newsletter, Illuminate, for continued support on your journey. Leave your own story of hope for others to read on the The Hope Tree Blog.